1. 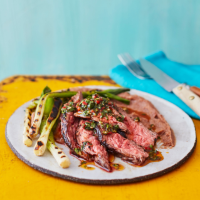 For the chimichurri, stir the garlic, chilli, herbs, paprika, oregano, vinegar and 100ml oil in a bowl (or whizz the unchopped ingredients in a food processor to save time). Stir in 1 tbsp cold water to loosen, then season. Warm the refried beans in a saucepan. 2. Take the steaks out of the fridge 30 minutes before cooking. Rub each with a little oil; season. Put a griddle pan over a medium-high heat. When the pan is smoking hot, add the steaks (you may need to do this in batches) and cook for 2-3 minutes on each side (for medium-rare). Wrap in foil and set aside on a warm plate to rest. 3. Rub the salad onions with a little oil before griddling for 5-6 minutes, turning often, until charred and tender in the middle. Transfer to a bowl and season. 4. Divide the refried beans between warm plates, then slice the steak and place on top of the beans. Drape the salad onions over and drizzle everything with the chimichurri.